Coming in to this HPT Final Table at Golden Gates Poker Room, Thomas Fuller had more in tournament winnings than 7 of the other 8 players combined. He started out slow, methodical, waiting for other players to make mistakes. Once played was 4-handed, Fuller went to work and magian din just one level to move from 2,100,000 to 5,200,000 in chips without ever getting to showdown once. He came within one card of ending the tournament without making it to heads up play when he, Terry Harper and Dave Hampel were all in 3-handed. Hampel limped, Fuller moved all in from the SB, Harper called off his 1,680,000 stack from the BB and Hampel called his total 4,130,000 stack off also. The flop was Q♥️ 4♦️ 8♦️, giving Harper a set and a flush draw for Fuller. 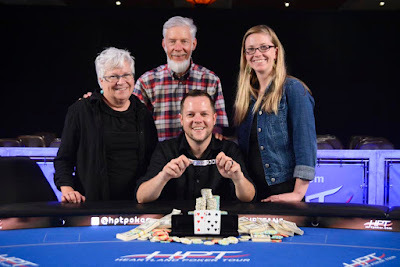 The J♦️ turn gave Fuller a flush, and he had the other two players covered, so he had to dodge a diamond (Hampel's outs) and pairing the board (Harper's outs) to become the HPT Champ. The river J♥️ paired the board, tripling up Harper, cracking the Aces of Hampel and eliminating him, setting up a heads-up match between Harper and Fuller. Harper took the first 5 heads-up hands, chipping up quite a bit, but Fuller regained control and managed the heads-up play from that point forward. The river was 6♥️ and Fuller had his title.